I'm up for Team 1, Week 1 in February's Swirlydoos Round Robin. The theme is "Something I Love", so appropriate for the month of Valentine's Day, and the challenge is to use some of our most loved - and hoarded - supplies, as well as a favorite technique. Well, here is a celebration picture and I'll admit that I've scrapped this photo of my wedding day before, but it just seemed so perfect for this theme. I dug deep into my paper stash and came up with two sheets from the August 2013 kit and an even older sheet that was part of a RAK that Swirly Mother Robin sent me in 2010. Because I wanted to do some heavy stenciling, I first applied a thin coat of clear gesso to my base paper (Splash of Color #30302 Beautiful). The stencil itself is one of my favorites - Natural Flourish by Layers of Color; I used Ranger Grit Paste as my medium. While that was drying, I cut a doily with the Summer Picnic paper from Prima's Strawberry Kisses collection using Cheery Lynn's English Tea Party die. I also selected a few metal pieces and after giving them a coat of gesso, colored them with Prima Metallique paint in Vintage Rose. I cut a few pieces from the second Splash of Color paper (Devotion #30304) and after lightly distressing them, I placed them under the photo, adhering a thin piece of chipboard under each layer to give it dimension. Before adding my embellishments, I decided to add a bit of stamping - just a hint - that would appear under my cluster of blooms and vines; I used my favorite script stamp by Inkadinkadoo. 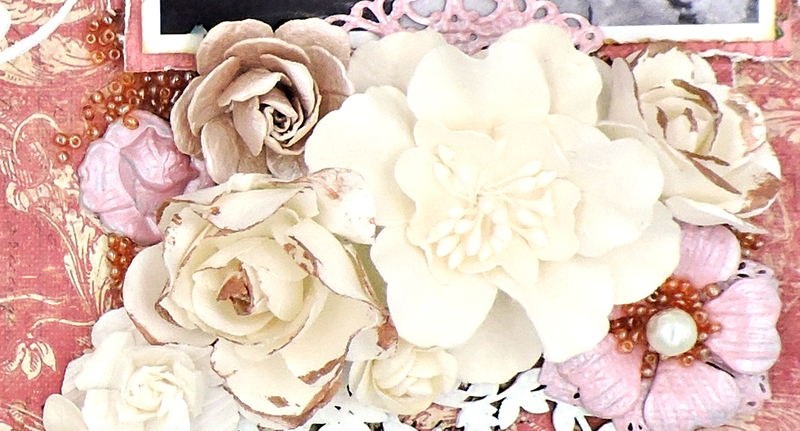 The flowers that I used to embellish my layout are all some of my favorites from Prima that I've had for a while. The beautiful chipboard underneath is Flourish 10 by Creative Embellishments, treated with a heavy coat of gesso. This is actually quite a large piece; I cut it in half and placed the vines side by side. To fill in my cluster, I adhered Prima glass beads in Plum here and there around the flowers. 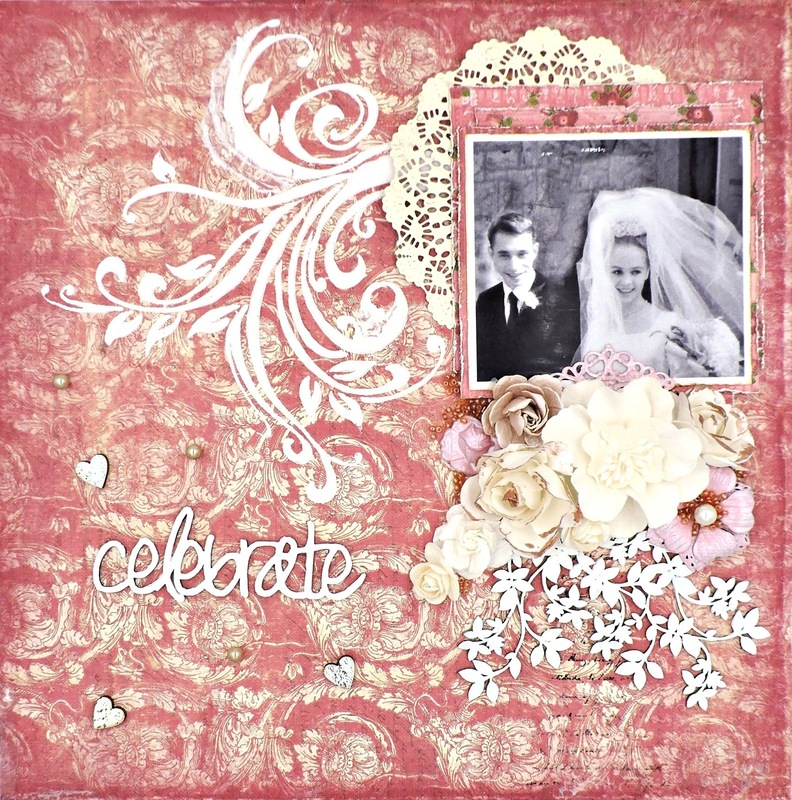 The "Celebrate" piece - also covered with gesso - is part of Creative Embellishment's Celebrate Word Set. 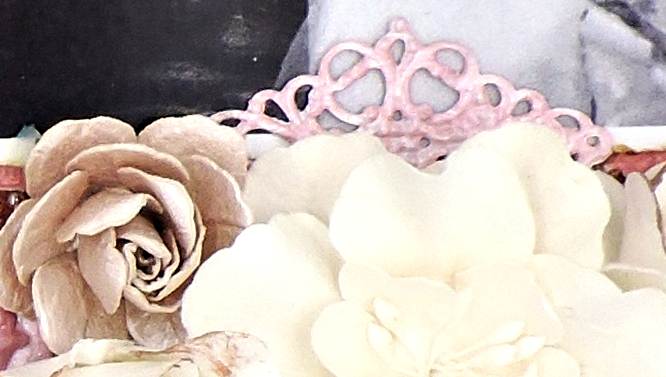 I've added a sprinkling of Prima Pearls II and some wood heart icons to finish my page.